Isn’t it just rich that one of the biggest charges made against the geese is their “aggressive behaviour”- as though humans are immune from such activity and somehow look down on it if they perceive it to be animalistic behaviour of a lesser species. One should therefore view it with some surprise than rather than condemn one species for this action, that many locals to the Sandwell area should actually celebrate human “aggressive behaviour” as some form of enterprise or even “heritage”. Bare knuckle boxing , like an early form of human bloodsport was a popular but illegal custom in areas like the blackcountry. It was especially contested amongst people who travelled from different areas by boat, and became part of the folklore of the waterways. Filthy decades worth of pollution was to follow- and some people call that “heritage” too. 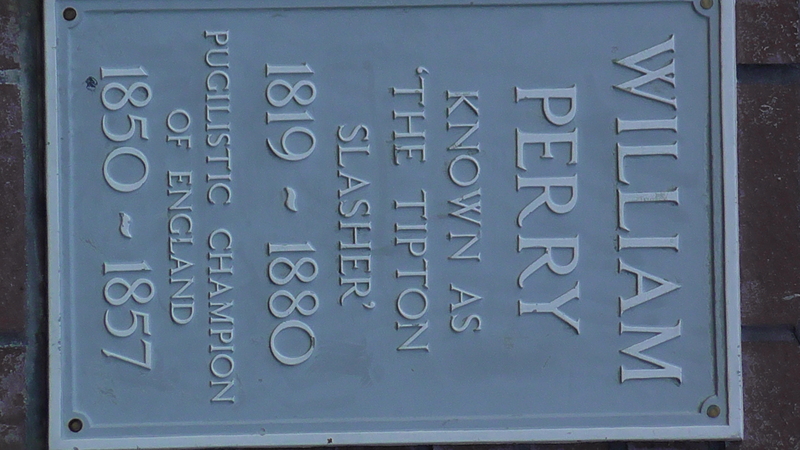 One celebrated Tipton pugilist was William Perry, alternatively known as “The Tipton Slasher.” Though not having that many fights, this “boxer” did participate in fighting virtually to the death, all in the name of money and fame, but little to actually show for it himself. He died an alcoholic at the age of just 61. One of his contemporaries Tom Sayers faired even worse dying at the age of 39. What fuelled underachievers like Perry and Sayers was an appetite for human violence, before the days of it being recorded and dispensed in film or art. A baying crowd and folklore becoming myth just added to the desensitisation of aggressive behaviour, which has become so glamourised by the media since the late 2oth Century. Gangsters are lorded like celebrities and victims of crimes are largely forgotten next to the names of those who killed them in cold blood- and there are even those apologists who would prefer to celebrate the aggressors rather than their victims- this is of course what creates advertising space- a book or piece of ceramic tat bearing the name of a celebrated local pugilist. 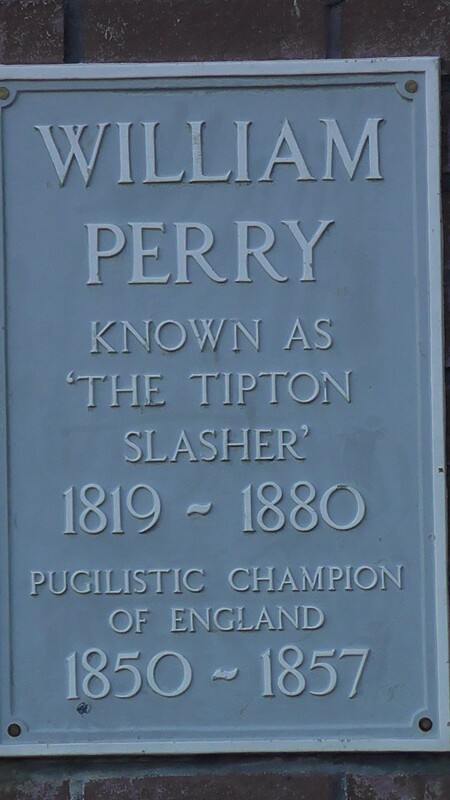 Rather than condemn such a drunkard none achiever, of which Tipton can be truly “proud”, Perry appears to be widely celebrated- but why? He didn’t do anything for others , and his contribution to society cannot be said to be great in any way at all. Indeed he wasn’t even that skilled a “sportsman” or any notion of what a sport is. People appear to celebrate his aggressive behaviour and strangely revel in it. Indeed it is possible to find less people and their dogs who claim to be NOT related to Perry than it is those who do. But is this the best that Tipton can really offer to the world, in that one of its most famous sons used his fists instead of any brain, and drank himself to an early grave? 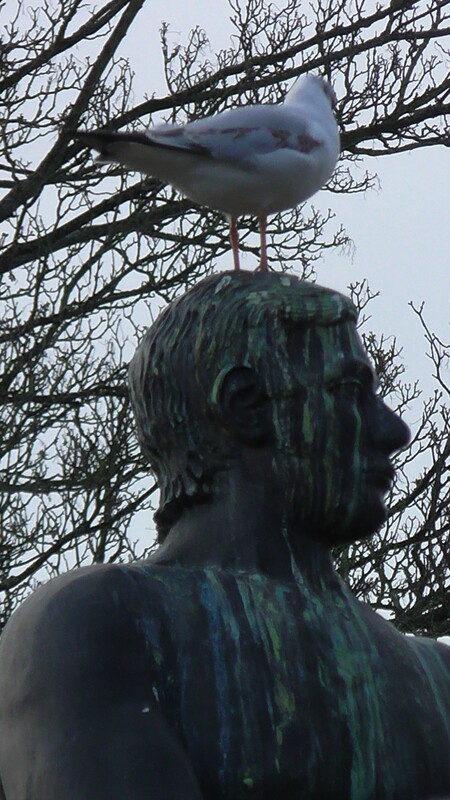 Where is the aspiration of such a legacy, the talent of the town, and what hope does it offer the youth of the area that such a man is to be sainted as someone capable of cutting people’s faces open as well as his own? 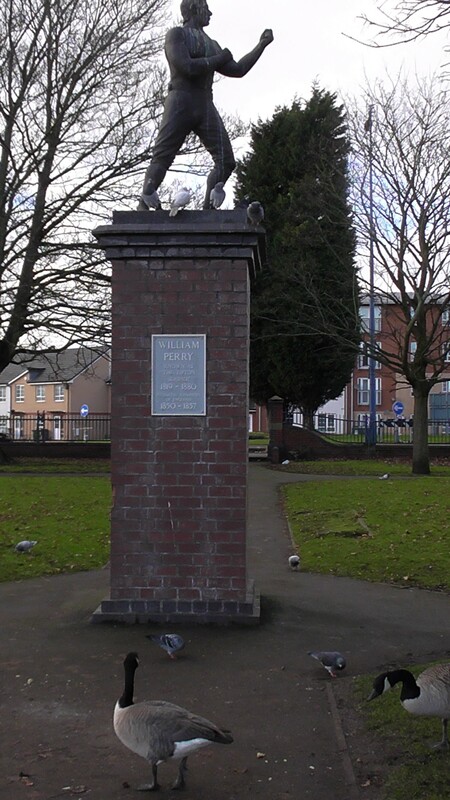 A statue near to Tipton Green canal offers a reminder to his “legacy” , whatever that really is except advertising space for more tat- but if this is Tipton’s legacy then please count me out of it, because it isn’t mine. 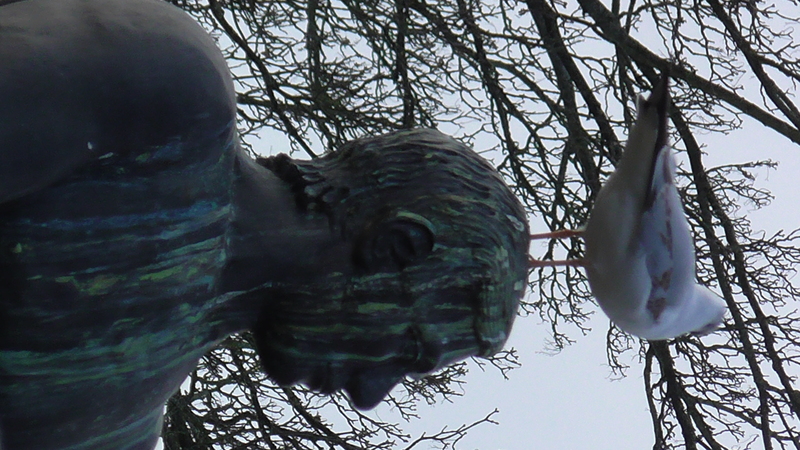 Big Bill doesn’t seem to mind the company of birds, who watch over him, as he watches over them. They are not baying for his blood like a rabid human crowd of old, they are just surviving their days out in quiet anonymity- nobody is making money out of them.